Attention! ladies. Treat yourself to a free makeover at Shoppers Stop. Shoppers Stop beauty experts are set to make you look all glamorous and ready for that wedding or dinner or even for work. Please make sure you book your appointment atleast 48 hours prior to the scheduled date. Bookings can be requested at all Shoppers Stop stores excluding the ones at airports. 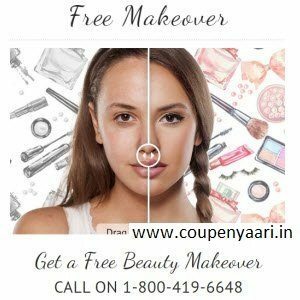 How to get Free Make Over at Shoppers Stop stores? Once your request is registered, you will get a call back confirming the date and time of your appointment. You can choose any one of the following offers: Basic eye makeup, Contouring & Highlighting, Natural everyday look. Treat yourself to a free makeover at Shoppers Stop. Our beauty experts are set to make you look all glamorous and ready for that wedding or dinner or even for work. To book a free appointment, call us on (toll free) 1-800-419-6648 and leave your name and contact details with our customer service team. Once your request is registered, you will get a call back confirming the date and time of your appointment. You can choose any one of the following offers: Basic eye makeup, Contouring & Highlighting, Natural everyday look.